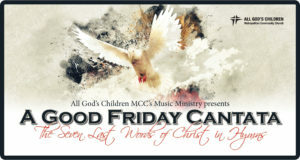 Join the AGC Praise Singers, Chancel Choir, and Praise Band for a musical exploration of the final words of Jesus as recorded in the Gospels. Through sacred hymns, we explore the heart and mind of Jesus as he endures the iniquity and persecution of crucifixion and meditate on his words as he died. We mark the story of Jesus’ betrayal, arrest, trial, crucifixion, and death in song even as we behold the depths of his love for us.